Made for the outdoors, the X-miniTM KAI X1 W and X-miniTM XOUNDBAR W are IPX7 waterproof certified, and deliver quality playtime of up to 8 hours. Singapore, 15 October 2018 – Award-winning audio brand X-miniTM announced the launch of their new the X-miniTM W series waterproof speakers: the X-miniTM KAI X1 W and X-miniTM XOUNDBAR W.
With an IPX7 waterproof rating, both speakers come in three fun colours – red, blue and white – and can withstand 1-metre deep water immersion for up to 30 minutes. In addition, the two speakers also feature a built-in camera mount with a detachable D-ring and carry strap for multiple uses, such as securing it to a bicycle handle for music playback while you cycle. The ultra-slim X-mini XOUNDBAR W has two 36mm audio drivers for quality stereo entertainment, and offers up to 8 hours of continuous playtime. You can easily slip it into your pockets for easy portability. It also enables hand-free calling with a built-in microphone. Pair it with a second X-mini XOUNDBAR W for a full True Wireless Stereo sound experience. The rugged X-mini KAI X1 W comes with a large 50mm audio driver that delivers a quality audio experience for up to 8 hours of continuous playtime, as well as a built-in microphone for hands-free calls. Its compact design makes it convenient to bring it anywhere you want. Pair it with a second X-mini KAI X1 W speaker for a full True Wireless Stereo sound experience. Fresh, fun colours – Both speakers come in three energetic colours: Red, Blue and White. IPX7 waterproof rating – Both speakers can withstand water immersion of up to 1 metre for a maximum of 30 minutes. Built-in Camera Mount and Strap Loop – Allows for multiple uses on any adventure, while travelling or cycling. Built-in microphone – Allows for hands-free calls, both indoors and outdoors. Enjoy True Wireless Stereo – Get a pair of either speaker to enjoy excellent left and right channel stereo sound performance. Long battery life – Up to 8 hours of playback time. The X-mini KAI X1 W is available from October 2018 in Red, Blue and White at x-mini.com and at major online retailers such as Shopee and Lazada, at an MSRP of S$69.90. The X-mini XOUNDBAR W is available from October 2018 in Red, Blue and White at x-mini.com and at major online retailers such as Shopee and Lazada, at an MSRP of S$52.90. 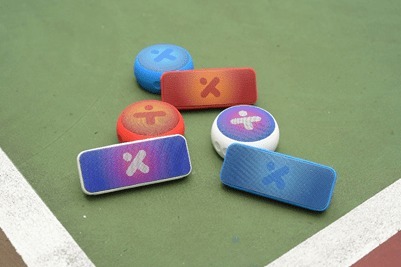 Founded in 2006, X-mini revolutionised the portable speaker industry with its iconic capsule speakers. The industry pioneer consistently delivers premium award-winning audio products that punch way above size and price. Its rich audio heritage is anchored upon an early commitment to develop its signature audio drivers ground up to create crisp, robust and vibrant sounds. Today, X-mini also partners other manufacturers to embed its acoustic expertise to deliver new sound products for both the consumer and enterprise segments.